From the Causal_Observer of the LSC.. This is actually a separate ranking system. I expect shake ups all over the top 15 next week. Thanks for the details! Appreciate that you’ve been doing this over the years! Last edited by NSU4LIFE; 10-01-2018 at 09:59 PM. Someone remind me when do the real regional rankings come out? I want to say after game eight but that might not be right. I don't think it is any earlier than that. I guessed 8 but it might be after 9. Way too early SR4 Rankings as of after week 6. MSU's win over Moorhead was enough SOS boost to beat UMD out for 1st? Yes. Not by much, but yes. Like I said a lot can happen in 5 weeks. 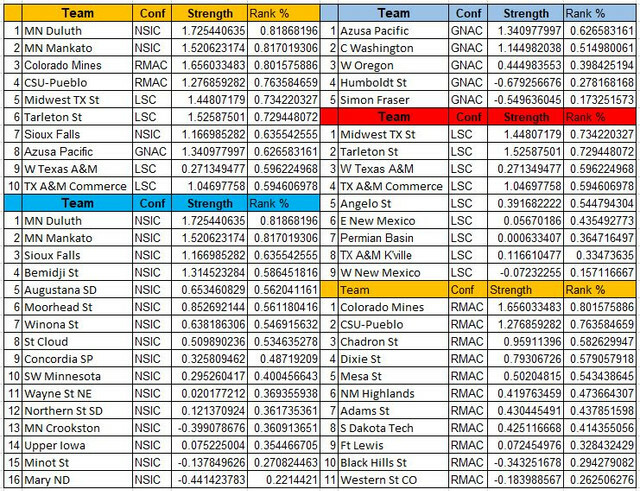 Like a GNAC team will likely get in because the NCAA likes to have at least one team per conference in. But I don't have any of them in as of now because they both have two L's. I believe if a top team from a conference finishes no lower then #8, then they get bumped to #7. But if a top team finishes below #8, then they stay home from the postseason. I do have just a little biased towards the mavs ;) but they've looked really good the last couple of weeks. Like I said theres still a lot of games left to be played and a lot can change! Both the top two GNAC schools have one D2 loss; CWU lost to WTAMU and one FCS school. APU lost to CWU and one FCS squad, so for rankings purposes just one loss. And Azusa still plays Colorado Mines and Central Washington again. Azusa should have a chance to show off how good they really are, or are not. Tarleton plays TAMUC and Midwestern over the next three weeks, so that will give a clear picture for the LSC. So playing FCS schools basically doesn’t matter then? If you say that, then sos for the gnac isn’t impressive either because you have a team from Canada that’s like crookston of the GNAC and a team that’s unfortunately on the chopping block. CWU’s d2 loss was a bad loss to West Texas. One thing I can say forsure is that a GNAC team won’t be getting a #1 seed. Yeah, I think, but not positive, that those are pretty much considered a bye week/No game for ranking purposes. If you are just after the host seeds then I agree. The GNAC likely doesn’t host, but I suspect the winner of the rematch gets in. And at least right now WTAMU isn’t a bad loss. They are 3-2 in D2, and have 2 very winnable games left out of 5. At this point they look to have a shot to go .500, and that is without any big upsets. Don't you mean, On the cusp? I mean, it is kind of apple season...so maybe he means they will be busy eating "The Crisp" instead of playing football?